We are excited to announce that we have moved to a new location. Our new address: 419 N. Shoreline Blvd., Mountain View, 94043. Our new office is about a mile from our current location. 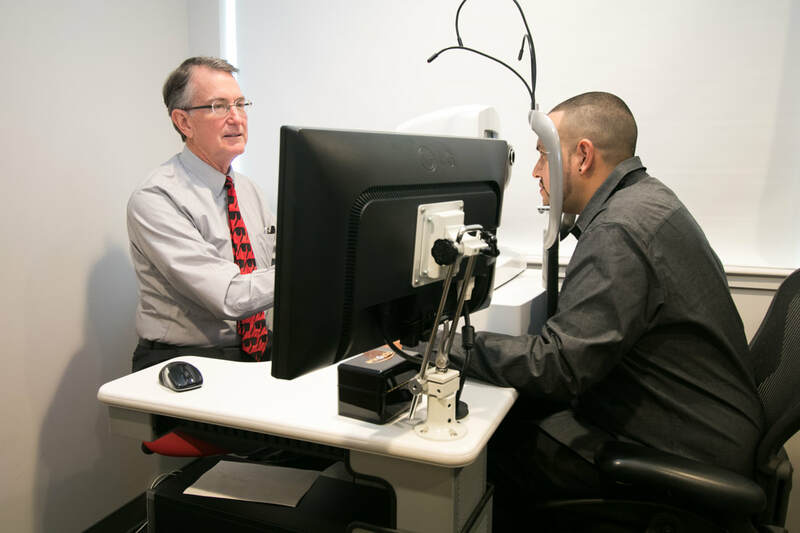 We are delighted to have a larger space to help better serve our patients and all their vision care needs. ​Keratograph: an advanced corneal topographer (it looks at the shape of the cornea), and can be used for dry eye evaulation and monitoring. Optical Coherence Tomographer: a.k.a. OCT, is new technology used to create highly detailed cross-sectional images of the cornea, retina and optic nerve. It is effectively "optical ultrasound", using light rays instead of sound waves to image tissue densities. We use this instrument to help diagnose certain conditions like glaucoma, macular edema, and macular degeneration. ​Optomap: unique technology that creates an ultra-widefield retinal image. It captures more than 80% of your retina in one panoramic image while traditional imaging methods typically only show 15% of your retina at one time. This instrument helps us detect early signs of retinal disease effectively and efficiently, in addition to a complete eye examination. "Soft puff" non-contact tonometer: You're all familiar with the so-called "puff test" -- that annoying little puff of air that gets shot into your eyes as part of your basic eye exam. The test is designed to measure intraocular eye pressure -- or pressure inside the eye. High pressure readings may be an indication of a serious eye disease called "glaucoma". Our new tonometer is designed to make the entire measurement process a comfortable and non-intimidating experience for you. The instrument features the quietest operation and softest air puff of any non-contact tonometer available. PROKERA: Offered from BioTissue, PROKERA biologic corneal bandage devices are used by eye doctors around the world to heal and treat eye diseases such as keratitis, common dry eye, recurrent corneal erosions, filamentary keratitis, persistent epithelial defects, neurotrophic corneas, herpetic ulcers, and many other ocular surface diseases. The PROKERA family of products are the only therapeutic devices cleared by the U.S. Food and Drug Administration (FDA) that reduce inflammation and simultaneously promote regenerative healing of the ocular surface.